The waiters were very friendly but we had to wait a long time . Really good food, batatas bravas it's a must, same has ovos rotos and to top it rigatonni. Service also goes with the quality of food. Great creative tapas, a wonderful wine list. Our server recommended the exact right amount of plates we should order. Request from my husband: could you please get a couple of local craft beers, like IPA or Porter or Stout on the menu? Thank you for a wonderful eating experience! Do not expect anything good from this restaurant - it is a snack bar. Snacks are not tasty, the bread is overcooked, the bacon was bitter, Canelonni Foie Gras was very spicy. There were three of us, but we were billed for 4 Cover (as is customary in this snack bar). This is the same thing that three people came to eat, but they have to pay for four(?). Snacks were cooked for a very long time. For almost an hour I was waiting for the Sandes Club (sandwich). The waiters passed by our table. In the end, they brought the bill without discount. This dinner was the worst. Great food, great restaurant, highly recommend! very limited menu. Few options and some were not available. Food was average, noting special, service was ok, some of them are very nice and but some was a bit odd. it was a little bit strange that one waitress turned a girl away when she tried to clean up table after the main courses, which was normal thing to do for most restaurants, anyway we had to ask to clean up, then she did it partially, was not a good job, we didn’t mind, still tipped 15%. Btw, we booked the table online, which was 30% discount on a la carte menu, but the discount didn’t apply on the total bill,,only after we double checked with them. 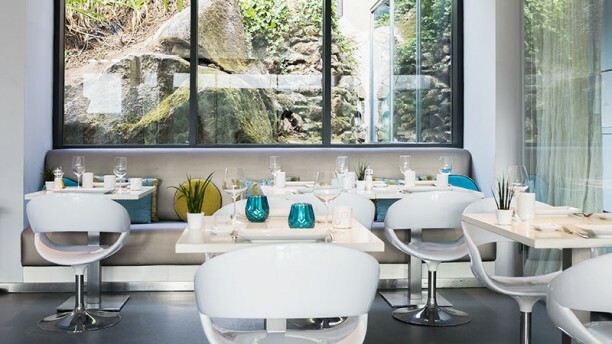 An important restaurant inside the Penha Longa Resort. The chef is the Catalan Sergi Arola: two Michelin stars. Try "Rigatonni" and "Veal". Hard to do better. Food was very good. Service too, but they asked for drinks in the beginning and than the menu. Wine and water were forgotten. No friandises with the coffee and for € 190,- for two persons I would expect this.